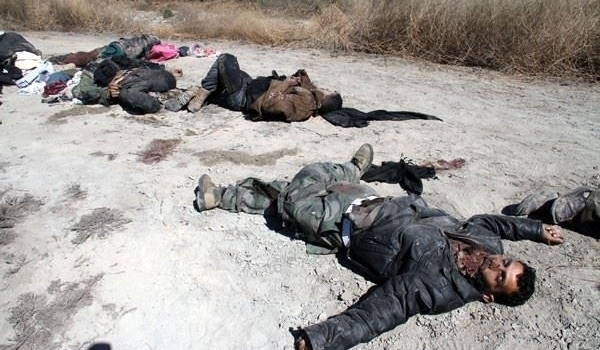 JNN 21 July 2015 Damascus : At least 400 ISIL terrorists were killed in the Syrian artillery attacks on a building known as al-Servat al-Hayvanieh which was ISIL’s command center. At the same time Iraqi forces have killed over 100 ISIL Takfiri terrorists in the province of Nineveh over the past 48 hours . Raqqa city, the capital of Raqqa province, is ISIL’s most important base in Northern Syria. Last week, military sources in the Northern parts of the country confirmed that a number of ISIL leasers were killed and wounded in a Syrian air force raid in Raqqa. The sources said that an ISIL leader of Saudi nationality with three of his guards were among the killed fighters last Saturday’s air attack of the Syrian warplanes on Raqqa. Iraqi forces have killed over 100 ISIL Takfiri terrorists in the province of Nineveh over the past 48 hours, senior army officials said on Monday. “Our forces have killed 108 ISIL militants in Nineveh province in the last 2 days,” Nineveh Province Operations Commander Brigadier General Najm al-Jabouri told reporters on Monday. He noted that many ISIL’s military bases were also destroyed during the Iraqi army’s operations in different parts of Nineveh province . Earlier today, Commander of the Iraqi Federal Police Raed Shaker Jawdat confirmed that the country’s forces targeted the ISIL Takfiri terrorists’ hideouts in the surrounding areas of Ramadi, killing a number of militants and destroying their vehicles. “The rocket launching battalion of the 2nd brigade of the federal police destroyed a large number of the vehicles of the ISIL terrorist group near the bridge of al-Sadiqiyah in Eastern Husaybah,” the police commander said. He further added that several boats loaded with improvised explosive devices were also exploded in the country’s shelling. Senior Iraqi officials have blamed Saudi Arabia, Qatar, and some Persian Gulf Arab states for the growing terrorism in their country. This entry was posted in Iraq News, Middle East and tagged Iraq, Iraqi Forces, IS, ISIL, ISIL Takfiri Terrorists, ISIS, Nineveh, Nineveh Province, Raqqa, Syria, Terrorists. Bookmark the permalink.